CProgressCtrlST is a class derived from MFC CProgressCtrl class. With this class your applications can have progress bars using bitmaps as seen in many modern installation programs and games! You also need a bitmap that will be used to draw the progress bar. For example include in your project Tile.bmp and call it IDB_TILE. 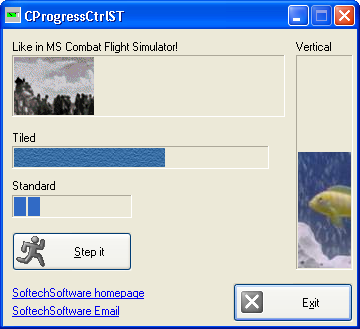 With dialog editor create a progress control called, for example, IDC_TILED. The control will have the same default range and start position as in the base MFC class CProgressCtrl. These values can be modified using the same methods of the base class such as, for example, SetRange or SetPos. At this moment OffsetPos is not supported. By default the control will draw itself just like a normal progress bar. A bitmap can be assigned to get a progress bar showing it instead of normal standard blocks! This bitmap will be tiled to paint the necessary portion of the progress bar; it will not be shrinked or enlarged in any manner. Your progress control is now a CProgressCtrlST! Sets the bitmap to use to draw the progress bar. //            Resource ID of the bitmap to use as background. //            Pass NULL to remove any previous bitmap. //        The resource specified cannot be found or loaded. //            Handle to the bitmap to use as background. Sets the upper and lower limits of the progress bar control's range and redraws the bar to reflect the new ranges. //            Specifies the lower limit of the range (default is zero). //            Specifies the upper limit of the range (default is 100). Specifies the step increment for a progress bar control. The step increment is the amount by which a call to StepIt increases the progress bar's current position. //     The previous step increment. Sets the progress bar control's current position as specified by nPos and redraws the bar to reflect the new position. The position of the progress bar control is not the physical location on the screen, but rather is between the upper and lower range indicated in SetRange. //            New position of the progress bar control. //     The previous position of the progress bar control. Advances the current position for a progress bar control by the step increment and redraws the bar to reflect the new position. The step increment is set by the SetStep method. This function is called each time the progress bar is redrawn. It is a virtual function to let derived classes do custom drawing. The default implementation does nothing. //            Pointer to the device context. //            Current percentage of the progress bar. //            TRUE if the progress is vertical, otherwise FALSE.